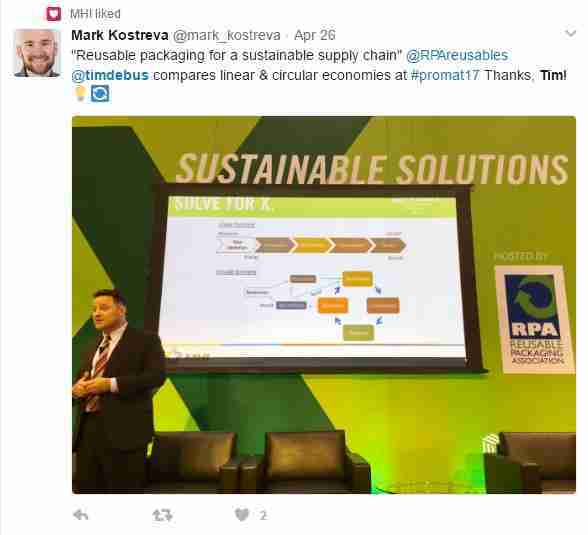 Tim Debus, President and CEO of the Reusable Packaging Association (RPA), gave a presentation on the topic, ‘Reusable Packaging for a Sustainable Supply Chain’ at ProMat 2017’s Sustainability Theater, outlining the powerful role that reusables can play in the transformative circular economy. 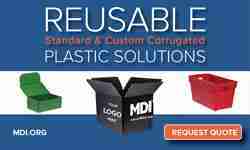 There are many different “players” involved in reusable packaging, Tim noted. They include companies that provide reusable packaging products, pooling services, reverse logistics partners, and the users of returnable packaging. Additional participants include raw material suppliers, repair and recycling services, transportation and logistics providers, providers of equipment and automation, technology and labeling vendors, and education and advocacy groups. RPA and its members focus on reusable transport packaging, Tim pointed out, not consumer packaging. The supply chains involved typically are from business to business. However, with the advent of e-commerce and increased shipments directly to consumers, there is some blurring of those lines, he said, a topic he returned to at the end of his remarks. RPA is not an advocate on which materials are used to make pallets, containers, or other reusable assets. Reusable transport packaging may be made from wood, plastic, paper or other materials. “We’re very much material neutral,” said Tim. The association does not represent one interest group alone. “We’re focusing on the reuse of these materials, extending the utility and value of the packaging products,” he added. 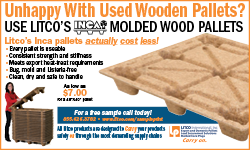 At the association’s exhibit at ProMat, the reusable packaging pavilion showcased pallets made up of four different materials, he pointed out. He described ‘closed’ and ‘open’ supply chain loops. 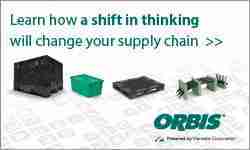 A closed loop is a “tight” supply chain with transport packaging only being shared among a couple of parties. As an example, he cited a parts manufacturer that may be shipping its products to a factory or assembly plant. The shipping containers are retrieved and returned to the parts supplier. An open loop involves multiple parties, and Tim cited the fresh produce industry as an example. Fresh produce represents a much more complex supply chain with more touch points and transfers of possession. Tim spent considerable time discussing and defining the aspects of sustainability. “What we thought was sustainable ten years ago — it’s changed,” he said. “It can be confusing out there.” Sustainability has three components, he said: environmental, social, and economic benefits. “All three of them have to work together.” Applying it to reusable packaging, he said reusables have to help the planet and people while enabling users to profit. He listed the favorable impacts of packaging on a sustainable supply chain in those three areas. The benefits to the environment, for example, are conservation of natural resources, including reduced mining and deforestation, and reductions in energy and water consumption, the generation of solid and hazardous waste, and atmospheric emissions. Economic benefits include greater efficiencies and cost reductions for manufacturing, transportation, storage and inventory, packaging, pallet unitization and cube utilization, and improved product protection and quality, recovery, and recycling. Social benefits include improved worker health and safety conditions from pallet stability, handling, and ergonomics, as well as labor and wages from growth in circular economy activities. Tim referenced his previously work in the banana industry as example in which over 30 impact areas through the supply chain were identified from a change in packaging. Each area can be studied and quantified to determine the impact on costs or savings; some changes would lead to a cost, others would result in saving. “So you have to look at the complete supply chain and net impact,” he explained, to reach a conclusion on sustainable performance. Tim contrasted two economic models, linear and circular. The linear model is a traditional one, using resources to make a product through value-adding processes, with ownership and liability for risk and waste passed downstream in the supply chain. The model applies to non-reusable packaging, Tim observed; the packaging supplier has no idea where his product is going to end up, and it winds up as solid waste that must be managed. The circular economic model strives to design systems to drive out or eliminate waste through reuse, repair, and recycling, by using products and materials at their highest utility and value. The activities of reprocessing reusable packaging create jobs while reducing waste, energy, and consumption of resources. Tim cited statistics that show humans consumes 60 percent more natural resources than the earth can renew and regenerate each year, referring to the Earth Overshoot Day (and the www.overshootday.org website). From Jan. 1 to Aug. 8 each year, the global economy consumes resources that the earth is still able to replenish. After that date, however, “We’re borrowing,” consuming more resources that the plant can regenerate. Ultimately, the linear economic model cannot sustain itself, said Tim. “The circular economy says we’ll build the reusable packaging; we’ll keep it in this continuous loop for as long as possible,” repairing or reconditioning it to extend its life cycle. The difference between the two economic models is that there is no waste with the circular economic model, he noted. Reusable transport packaging goes back to a producer or distributor for reconditioning, or it goes back to the raw material supplier for recycling. By contrast, waste that results from the linear economic model must be recycled to its original composition or simply buried in a landfill. He differentiated between reuse and recycling but noted the terms have been used interchangeably in the past. “There’s a difference,” noted Tim. He referred to the waste management hierarchy of the U.S. Environmental Protection Agency. Source reduction and reuse are alone at the top tier because they prevent waste. “Everything else is managing that waste,” said Tim, including recycling. 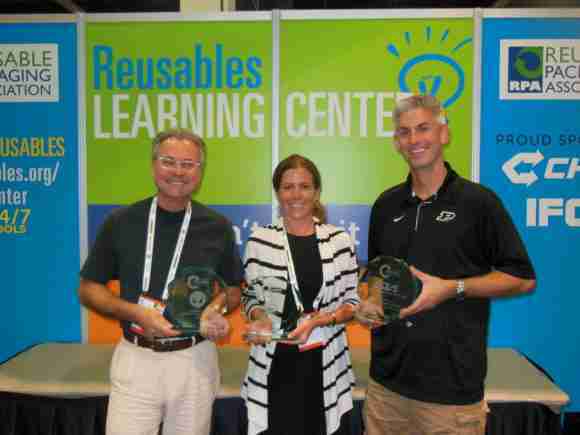 Reuse scores a “sustainability trifecta” and promotes a circular economy because it achieves the three benefits of sustainability. Environmental benefits include conserving natural resources, reducing energy consumption and emissions, and eliminating waste. The economic benefits are improving supply chain efficiency. The social benefits include the labor-friendly design of products and systems, consumer preference for reusable packaging, and the creation of new jobs and economies by the renewal of goods and materials. The social benefits are significant, noted Tim. Packaging products are more ergonomic and compatible, they move through automated handling equipment and are safer for workers. As for consumer preference for reusable packaging, he cited a study last year showing that 64 percent of consumers believe reusable or repurposable packaging is a “key purchasing driver.” That study shows consumers recognize the value and benefits of sustainability, he added. The new economies and jobs that are being created by the complete cycle of reuse have a significant economic impact. In fact, studies have shown that the circular economy can drive a $1 trillion benefit to the global economy by reducing cost and create jobs. European countries already are beginning to shape public policies to support the circular economic approach. Tim adapted a concept from the Philips group of companies about the four enablers of a circular economy: business model, design, collaboration, and reverse logistics. He added a twist, labeling them “essentials,” not enablers, and applied the idea to reusable packaging. Business model refers to using a systems approach and maximizing the usage of transport packaging, managing those assets, renewing the materials at the end of the life cycle, and driving performance. The design of packaging products must be durable with long lifespan, optimized for repair or refurbishing and retrieval and reuse. The collaboration component refers to all the participants working cooperatively together — suppliers and users and third-party service providers — teaming for common standards and to share data to create efficient supply chain loops. The reverse logistics element includes not only retrieval but also reconditioning, repositioning, transportation, and pool speed. “These are essential,” said Tim. Technology will be the enabler to expand reusable packaging further, said Tim. “It’s going to make reusable systems more possible in the future.” Advances in technology are going to allow for better business models with greater tracking and increased visibility in the supply chain. Such technologies will enable better inventory management, better product design through material science and sensors, more collaboration by sharing of information with business partners, and improve reverse logistics by the consolidation of hubs, route optimization, better fleet efficiency and eventually autonomous vehicle integration. “It’s an exciting time,” said Tim, what technology is enabling for reusable transport packaging systems. He described supply chains based on the linear economy as ‘transactional’ and those based on the circular economic model as ‘transformative.’ Supply chains are evolving to the circular economic model, he said, and eventually may evolve into a hyperconnected economic model, which he termed ‘transcendent’ with even greater connectivity and coordination among business and trading partners. New technology is making the change possible. In response to a question about how companies can improve collaboration among supply chain partners, Tim suggested participation in trade associations and trade show events, networking with suppliers of reusable packaging as well as technology and logistics, and dialoguing with customers. Another member of the audience asked Tim to provide examples of original equipment manufacturers who are excelling with the use of reusable packaging. He cited the automotive industry, which he said is “very mature” in its use of reusable packaging. He referred to closed supply chain loops between parts manufacturers and assembly plants, with shipping containers being returned to the parts companies to be repeatedly used for shipments to the factories. Subaru won the Reusable Packaging Association’s Excellence in Reusable Packaging Award in 2015 for its automobile manufacturing operations in Indiana, he noted. (Read the Subaru case study here.) The automaker increased reuse from 86 to 91 percent. The increase may seem small, but Subaru enjoyed “significant cost savings associated with that,” said Tim. Applications of reusable packaging are developing and growing in the retail industry, he said, although they are considerably complex. The pharmaceutical industry is embracing more returnable packaging, he said, with the need in some cases for temperature-controlled packaging, tamper-evident packaging, and RFID technology to track products. More and more companies like Amazon and others are shipping directly to consumers at home, he noted, while at the same time they are exploring ways for source reduction — to avoid the use of packaging — or systems in which packaging can be used to deliver a product to a home and then recovered. Amazon, for example, has a network of stand-alone lockers where customers can pick up orders or return merchandise. The industry can collaborate on common areas to make home delivery in reusable packaging more viable, said Tim. “It’s a terrific idea. I know our members are working on solutions every day…Reusable packaging will have a role in the e-commerce sector. I think our recycling bins need it,” and consumers are asking for it. 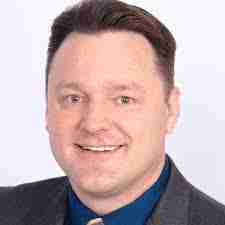 Tim Cox is a Virginia-based freelance writer, editor and marketing communications practitioner. Is there more to this story? We look forward to your thoughts about this or any other stories you think we should know about. Email: rick@packagingrevolution.net.